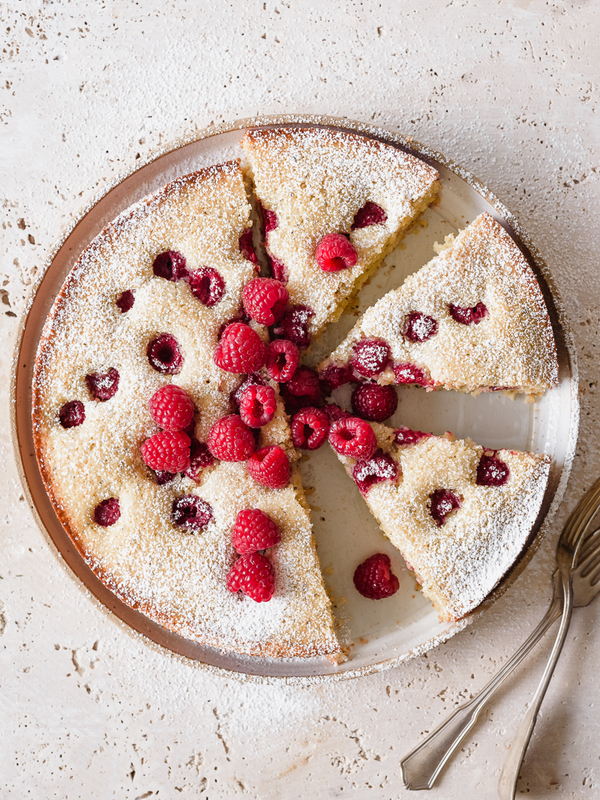 A simple raspberry lemon poppy seed cake, filled with fragrant citrus, vanilla, and almonds, and dotted with jammy berries – it’s the perfect sweet afternoon treat. Are you a fan of gloriously stacked and filled and frosted beauties? Or do you fall into the humble single layer cake camp, served simply with a dusting of sugar, a casual dollop of fresh whipped cream, and maybe a scattering of fresh berries? 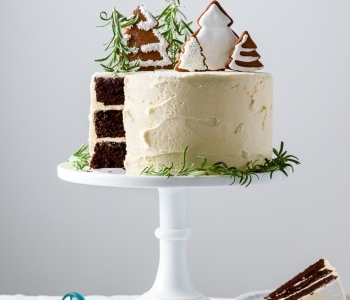 While I do love layer cakes, simpler versions make their way into my oven much more often. What these uncomplicated cakes may lack in spectacle, they more than make up for in flavor – and ease. Minimal fuss, but maximum results thanks to good ingredients. 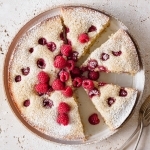 In the case of this raspberry lemon poppy seed cake, fragrant vanilla bean, ground almonds, olive oil, and fresh citrus elevate ordinary sugar, flour, and eggs. 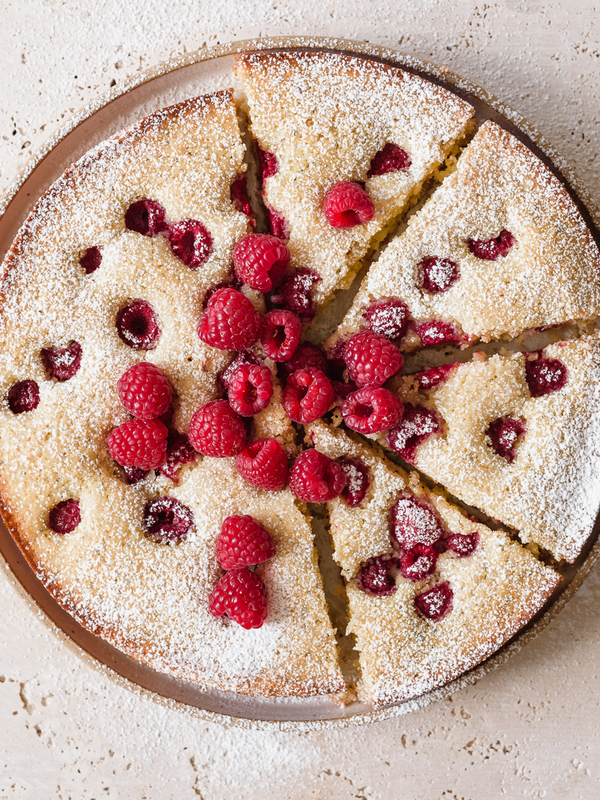 It may be rustic, but the resultant golden, berry-studded cake shines. This raspberry lemon poppy seed cake comes from Julia Turshen’s lovely cookbook, Small Victories. Turshen calls her original an “Afternoon Cake,” as it’s a not-too-sweet, simple to throw together treat that makes for an excellent late afternoon pick me up (especially paired with a cup of something cozy). I added poppy seeds and a handful of plump raspberries to the batter right before baking – because, of course I did. A tablespoon or so of coarse sugar sprinkled over top renders them ever so jammy as they bake and sink gently into the cake. Strawberries, blueberries, or blackberries, or any number of stone fruit varieties, sliced thinly and layered on top, would likely be delightful here as well. You can make your own almond meal/flour by grinding up whole almonds in a food processor (just stop blending before they become almond butter!). Using blanched almonds will result in a finer, more delicate crumb, similar to store bought options. OR, the almond flour may be omitted completely (subbed for equal amounts all-purpose flour). 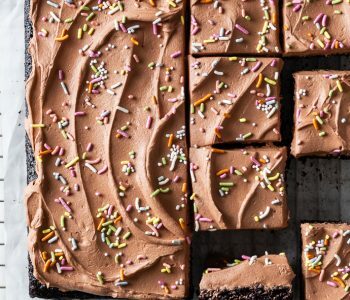 Either way, know that it enhances the other flavors in the cake to a wonderful degree, and if it’s an ingredient you keep on hand, I’d encourage you to include it. Oh, and while regular lemons will more than do, if you can find them, sweeter, more complex Meyer lemons, freshly juiced and zested, truly make this already sublime cake sing. Preheat the oven to 350℉. Line a 9-inch round cake pan² with a circle of parchment paper. Lightly grease the paper and sides of the pan with butter or nonstick baking spray. Set aside. In a small mixing bowl, whisk together the flour, almond flour, baking powder, and salt until combined. Set aside. In a large mixing bowl, whisk together the eggs until fully combined. Add the olive oil and 1/2 cup sugar, and whisk until the sugar is dissolved and the mixture is fully emulsified. Stir in the vanilla and almond extract, if using, followed by the lemon zest and juice. Gently but purposefully fold the flour mixture into the wet ingredients until just combined, being careful not to over mix. Stir in the poppy seeds. Pour the batter into your prepared pan, smoothing out the top with a spatula. Gently tap the pan against the counter a few times to eliminate air bubbles. Top with the raspberries and sprinkle with the remaining 1 Tbsp sugar. Bake until the cake is golden and a tester inserted into the center of the cake comes out clean, about 25-30 minutes. Transfer the pan to a baking rack and let cool completely. Once cool, run a knife around the edges of the pan to loosen the cake, then carefully flip upside down to remove the cake from the pan. You may need to tap the bottom a few times. 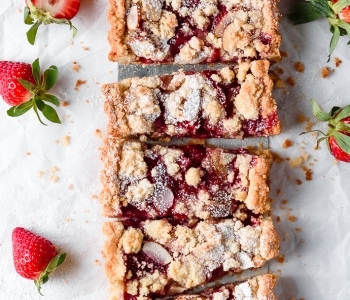 Serve with fresh berries and a dusting of powdered sugar. Enjoy! ¹ Look for Meyer lemons if you can find them, which have a more pronounced, floral flavor. ² I like to use this 9-inch round cake pan with removable bottom for most cake baking. Lined with these parchment paper rounds, it makes taking the cake out of the pan nearly foolproof (and there’s no flipping!). Recipe adapted from Small Victories by Julia Turshen. I purchased a can of Poppy seeds. Do you know if they can be frozen? I have so much left over, and won’t use them again for several weeks. This is so light and beautiful ! Perfect spring dessert ! Thank you ! I have made it and it is super flavorful and delicious. Thank you! Have you tried freezing the leftovers by any chance? Thank you! So happy to hear that, thank you!! And I’m not sure… they’re weren’t any leftovers 😉 I’m not 100% confident that it would freeze well, because the crumb is fairly delicate, BUT if you were to try, I’d wrap it really tightly in a few layers of plastic wrap. Hope that helps! 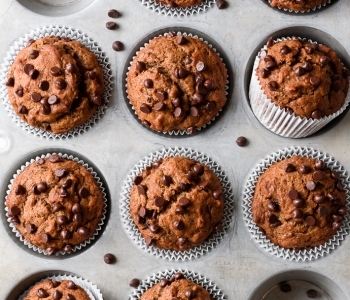 – We love almonds and almond flour anything. This cake uses only a half a cup of almond flour, but with the help of almond extract, almond flavors are very noticeable. If you love almond flavors, you should make it. – Don’t skip on the raspberries. I think the best part of this cake was that the raspberries stayed intact. 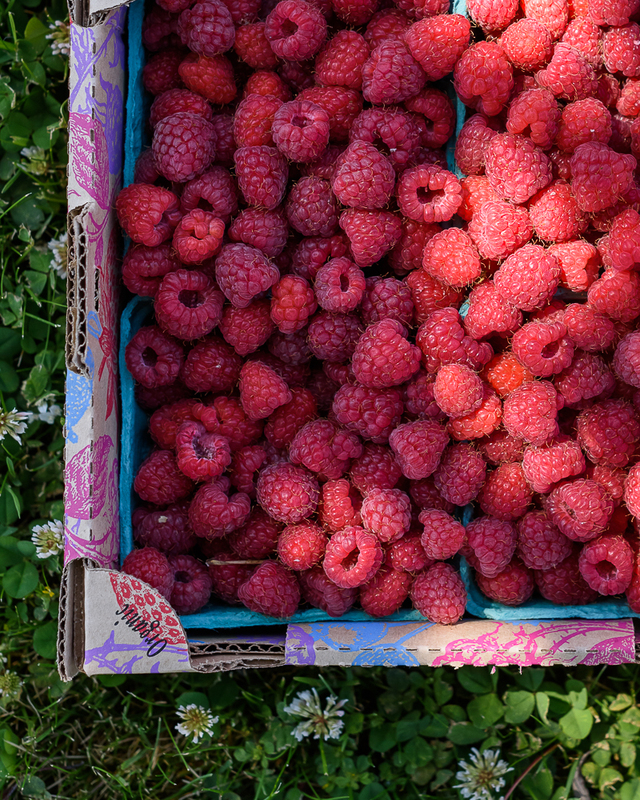 As a result, with every bite we ended up with a juicy and sweet raspberry. I used half a pint in the cake, but next time I make this cake I plan on using the whole pint. – It took a little longer for my cake to bake, but my oven can be funky at times. – I served it as an afternoon tea cake, but my husband said that this is a great cake with his cup of morning tea. Make this cake guys! You will love it. Thank you so much for your lovely and detailed comment!! I’m so happy you enjoyed this cake as much as I do, and I’d love to hear if you try this with maple syrup. Thank you sweet friend! Oh, Laura, this looks so yummy! I can’t wait to try it! Thank you so much, Louise! !